WiiWare has introduced us to a lot of talented developers who seem to have sprung out of nowhere. Think of the likes of Gaijin Games with their Bit.Trip series, Ronimo Games with Swords & Soldiers, and of course 2D Boy with the sublime World of Goo. From the moment that NyxQuest: Kindred Spirits was announced, it already looked like Over the Top Games would be another developer to add to this quickly growing list. Now that it's finally out, does it live up to expectations? 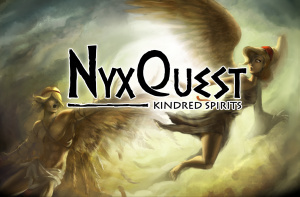 In Nyxquest, you control Nyx, a winged girl who has come down from the heavens because Icarus, a mortal human who used to visit her regularly (with his wax wings, just like in the ancient myth) has gone missing. When she arrives in the world below she finds that it has been absolutely ravaged because of a war between the gods, leaving nothing but a desert wasteland littered with the ruins of civilization. The game plays somewhat similarly to the excellent WiiWare launch title LostWinds. Nyx can only move around on a two-dimension plane, but the backgrounds, characters and objects are rendered in 3D. She starts off with almost no abilities - moving around, jumping and pushing blocks are abilities expected from pretty much any platform game hero, but she can also use her wings to temporarily glide, and do five extra "hops" in midair to gain extra height or airtime. Nyx can take hits from enemies four times - a fifth time will kill her. Most levels have an abundance of extra health for you to collect, and you also have an infinite amount of lives, so you never really have to worry about things getting too tough. As Nyx manoeuvres through the levels, she'll gradually gain more abilities directly from the gods. For example, the famous Zeus will rather quickly bestow upon you the ability to "grab" certain blocks and fireballs with your pointer, then moving them around. Naturally, bigger blocks are harder to move, so you'll find that lifting them is nearly impossible, whereas smaller blocks can be thrown all over the place without much trouble. Just watch out you don't throw one on top of Nyx or she'll die instantly – it’s a good thing that there are checkpoints, really! All of the extra "abilities" are performed with the B button, because you move and jump with the control stick and A: this means you can move around and simultaneously use the B button to do other things, which always feels quite satisfying. There are a total of 13 levels in the game, with the final one being a bonus stage that has to be unlocked. They're all surprisingly long , you'd think the game's great graphics would mean that the levels would almost have to be pretty short, so as not to exceed the maximum WiiWare game size, but most of them will easily take you about 15 minutes to clear, meaning the game totals up to around 3 hours. That's about the expected length for a puzzle/platformer game, but you can't help but feel it's just a little bit too short. It’s hard to begrudge this as the game is so much fun to play: it’s better to be on the short side and packed with innovation than long and drawn out with lots of recycled sections. NyxQuest also features a two-player mode that we should mention. Sadly, this doesn't let you play with two Nyxes simultaneously. Rather, one player controls Nyx while the other uses the special abilities which are normally mapped to the B button. It's a nice option to have but it’s more of a novelty than anything else. Of course, you can't play this game without noticing its fantastic visuals. We don't know how they did it, but Over the Top Games has somehow managed to create the best-looking WiiWare game yet. Those screenshots aren't a lie, it actually looks even better in motion. Yes, yes, we know that every single level in the game is set in a desert wasteland, but there's still quite a bit of variety in design between the levels, and you'll probably very softly say "wow" more than once. 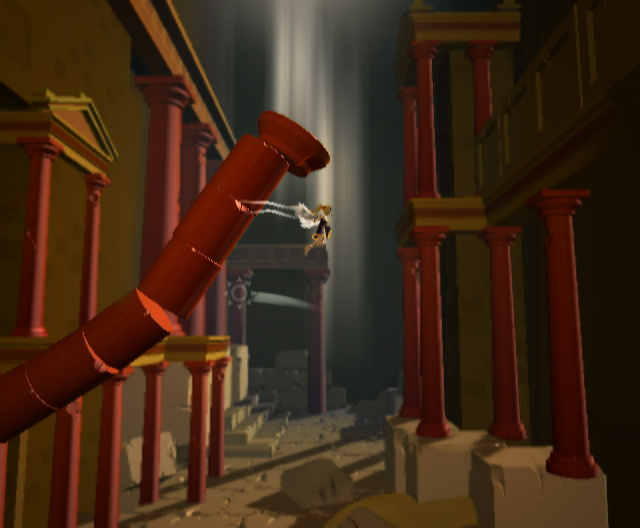 The music is quite decent too; all of the songs have the ancient Greece vibe which naturally fits all the various structures found around the levels perfectly. In terms of gameplay NyxQuest does not disappoint. You'll only really encounter two normal enemies, Harpies and Satyrs, and just one "boss" who appears multiple times, the Hydra, but for the most part the game's primary focus is on puzzling anyway, so this can easily be overlooked. You'll get three new abilities throughout the game, so just when you think the levels might start getting repetitive, you'll get a new ability and the levels naturally get puzzles based around it. The developers have thought up multiple clever uses for each ability, managing to fill up every level perfectly. It’s hard to say quite how much replay value there is in NyxQuest really. 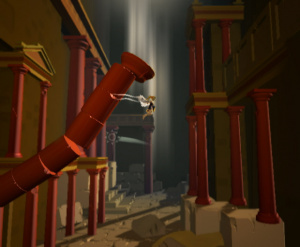 There are 20 "relics", items belonging to the gods, scattered around the game's initial 12 stages, and collecting all of them will unlock an extra 13th stage. It's a bit harder than the previous ones, but about the same length. Once you've beaten it there's really nothing else to do. However, although the game's focus is mostly on puzzles, they're not the type of puzzles which, when you know the solutions to them, make the game boring to replay. 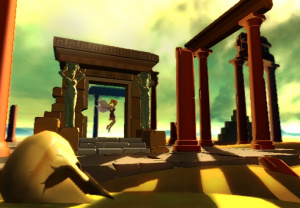 As with LostWinds we would recommend taking a break and replaying it in a few months to enjoy it all over again. Over the Top Games is yet another indie developer to keep a watchful eye on. They came out of nowhere with NyxQuest: Kindred Spirits and have managed to create a beautiful looking game which is also lots of fun to play. It’s true that it is not a massive game, you should be able to beat it 100% in just 3 hours, but those 3 hours will be completely filled with pure platforming bliss. This is exactly the sort of thing we want to see more of on WiiWare and comes highly recommended to all. Awesome, I've been hoping this one would turn out well and it seems it has! Hopefully NA gets it soon. Sweet, I'll get this when it comes out in America. I'll buy this and S&S with a 2000 point card. Really though, this seems a lot like LostWinds. 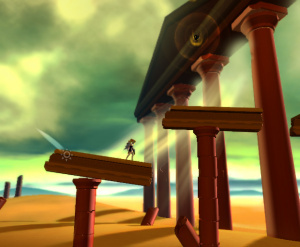 Short, puzzle-platformer, Wiimote controls special abilities, really, it seems like a LostWinds clone. Not that thats a bad thing, LW is great, but the similarities seema a bit much. Wow, a 9. Definitely on my list of games to get then. It has some similarities to LostWinds with the pointer mechanic but it plays pretty differently. Amazing, I am definitely getting this when it comes out! I don't mind if the game is a little bit on the short side. As long as the game is fun to play that is what really matters to me. Plus it has innovative gameplay, gorgeous graphics and beautiful music; this is exactly what I want from WiiWare! Great review Drake! I personally don't mind length, as long as the game's fun and unique, length never matters. Especially for only $10. Aw, man, Corbie did not rate this? Either way, you convinced me to buy this game. The lack of opponents might not bother me, since this game sounds a lot like Klonoa. "Those screenshots aren't a lie[...]"
You could also say that the screenshots were FMVs, which look better than gameplay graphics, yet Icarian seems to surpass that. So glad to see this review turn out so favorable. WiiWare certainly has its embarrassments, but there are enough gems out there now to more than justify the service. Another game to add to my must-play list. Whoah! Didn't expect a 9! I'm getting this the moment it's available in NA. Way to go Over The Top Games! This game is really good. I enjoyed it loads! my time was 6hrs to complete it all, bonus stage n all. 6hrs of joy! Any news on the NA release? I'll be picking this up for sure. 9/10? Wow, really surprising... I have to eat all my words all the times i said i didn't specvted nothing from Ikarian... Maybe i'll download it, but just maybe. @Egg - Perhaps for the mortal gamer it will be a longer lived experience. sym1 said it took him 6 hours to nail. Marcel is sometimes TOO good at games! Yeah Marcel has mad gaming skills. So what takes him like 3 hours takes most people 6 hours. Took me just shy of three hours to finish the game, and especially in the last levels I died pretty frequently. The music fit well in the game, the game didn't overstay its welcome (or differently put, it didn't get boring and monotonous at any point) and the gameplay was fun. The next task is to collect all the relics then. Overall, a solid game in my opinion. I agree. Very good game with a absolutely nice style - but, I´m not that enthusiastic about the grafics. Yes, it looks like on the pictures above, but there is a lot of flickering around, especially in the first levels. I liked a lot the Cloud-Area at Äolus´ temple - that was outstanding gameplay. Also, after the sixth level there is no longer any message about the use of your special abilities. Thats great - I hate games which tell you right before the endboss in level 45 still how to use your remote. Wow, great review Drake, didn't expected that much from this game, seems like a must have to me, lets wait and see, when NOA decides to release it over here. Said it before, i'll say it again: Do want. 3 hours? No way I'm gonna buy that, way too short for my money. I'll guess I'll watch an playthrough of it on youtube someday since it's so good. I didn't expect much of it either! I'm glad I was proven wrong and I'm especially glad Drake was the one to do it! It sounds to be just like LostWinds in the length department and for the same price, too. That may be a stickler for some. People need to stop being picky about the time it takes to finish. So what if it will take you maybe 3-5 hours to beat it, if you had a good time playing it then that what matters. There's plenty of full priced games these days that are 6-8 hours long (and crap) but that's ok right? Oh well, to you people I say it's your loss. Good score for a brilliant game. Length doesn't matter, as long as it's good. I would rather have a delicious steak than 6 cheeseburgers, and I think most of you would too. Many full priced games are only a few hours long, but they are fantastic (ex-Call of Duty 4 campaign, only 7 hours, but 7 hours of sheer pwnage). Another example is Portal, which is only 4 hours long, but breathtaking and amazing. Really, quality over quantity. I've just been playing Icarian for the last couple of hours. This honestly is a great and very innovative game. It reminds me of LostWinds in a lot of ways, but the environments are far more interactive in this. It's very entertaining, and challenging too in places. As Bahamut says it's better to have quality over quantity. If this takes me only 3 hours to complete I won't feel short changed. I am sure it would be something you could go back to after a bit of a break and start again. @ Bahamut: I actually just replayed Portal and it took me about 50 minutes. That's a good example of a game that gets much, much easier when you know all solutions. I think for Icarian even if you know everything it'll still take 3 hours. As soon as it comes out in NA, I'll be sure to get this. I just wonder when we'll get it? I'm glad to see this get a 9. But for me the problem with WiiWare platformers is that they're all too short. If I'm done with this in 3-6 hours and have no real reason to go back then I'd probably prefer to get myself something like Wave Race 64 or Dr. Mario on WiiWare. Don't get me wrong, it does make me happy to see this get a 9, and also to see that a lot of you are supporting it. But the length is just not my gaming cup of tea. I barely have time to play games anyway, so short doesn't bother me at all as long as it's good. I'd rather play ten minutes of Ocarina of Time than 50 hours of Superman 64. @Drake: I think there's a speedrun of Portal in 14 minutes. Now that's soe mad skill. So did anyone get the soundtrack? So, Lostwinds 2? I'll pass. I`ll get this and Majora`s Mask. These complaints about game length sound pretty winey. Super Mario Bros. is a fantastic game but most of you could beat it in a half hour. Dragon Warrior takes longer to finish than Castevania but the latter is (IMO) a better game and well worth multiple play throughs. If you're willing to buy (and play) some of these classic sidescrollers which used to cost $60+ on release back in the day, then why all of the fuss over $10 for something today of equally high quality? According to the review, this sounds like a mix between Lostwinds and Klonoa, which is definitely a good thing in my book. It's not the second coming of Kid Icarus like I hoped, but I'm saving points for this nonetheless. This game is simply fantastic. I like, that the physic is great, so that I can use the B button and the Wiimote, to move objects around... especially the "surfing" parts on a rock are great. I'm at the second level - Valley of the Temples (or something similar - I'm playing the german translation). Nice, I'll be making sure this is my next download. Cheers for the review! Back when Super Mario Bros was a new game, it provided challenge and gameplay time to pay back the invested money. Sure, it might take you half an hour once you have played the game enough, but to get to that point (or even finish the game for the first time) you probably had played it for quite a few hours by then. This wasn't the case with Icarian. Now, I'm not saying Icarian should've had limited lives and continues, but I'm not a fan of the tradeoff as it was done here. As for the replayability of the game... I can't say anything about it yet. That's one way the game can overcome its shortness. I don't know how well time attack mode could've fit the mood of the game, but that would've been one small possible addition. @Theblackdragon- I agree. I'm glad it's a complete game. I love it when we get games that stand out above the crowd. the spirit of greece,thx spain. @theblackdragon....I really liked Lost Winds alot. Im getting this as soon as I get my Black Wii. People from the EU can officially no longer complain about unfair treatment of game releases. Yes, but we still didn't get Protöthea and some other games... especially the action-titles... humpf. I hope we don't have to wait to long for this. Wow, I'm surprised that this game did so well. I thought that Icarian was going to do well, but I was expecting a 7 or 8, so a 9 is surprising. Great review, Drake. Oh, and I'm all for the 10 star rankings, since it's more percise than the 5 star system, yet it isn't over the top (pun not intended) like metacritic (with 100 point systems). I will finish it tonight. Yesterday I played 2 hours and 39 minutes - and reached the middle of Level 8. I guess there will be another hour or maybe 1 1/2 for me. And for trying to get all the hidden items it will be much more. 3 hours? No - not for me. Great game. Excellent, I've got about 90 minute's play in(I've got a wife and kids, that's some serious time for me) and I'm just onto the fourth level. Looks lovely, definite similarities with Lost Winds, but definitely tougher than LW. I don't care if it only takes me another 2-3 hours to finish, it's something I'll come back to like LW, Ico, Metal Gear Solid and, to a lesser extent, the God Of War games because the overall gameplay experience is so GOOD. It's good - very good - but not perfect which is why I agree with the 9/10 score. Level 9 grated a bit due to the rather tedious pacing and I'm glad the aesthetics have changed now I'm on Level 10, but I haven't lost interest yet, which is an achievement considering my usual disdain for WiiWare titles. I've estimated around 5 hours of game play - way longer than LostWinds (which took me all of 3 hours from start to finish) - and this game definitely has much better environmental set pieces that are definitely the bread and butter of this game. I do feel that some elements of the game are a little 'throwaway' - particularly the rather dull (though well animated) enemies. I can see where you're coming from with the replay-ability too Drake although I'd say this game's puzzles will fair considerably better than LostWinds. Not only have my initial fears about this game been proven wrong but I'm truly impressed with this review which offers top quality feedback to the point where I agree (almost) wholeheartedly on every point made. Not that I'd expect anything less - keep it up fella! @Calculon: Calculon likes it. It's official, it's a good game. I beated the 12th level yesterday night. Completion time 4 hours 30 minutes. I still have to collect 7 items to reach the level 13. Great game. Wow... there seems to be a majority of very high praise for this. And though I'm with everyone who says Length Doesn't Matter (no jokes, please), I'm still a bit concerned with the idea that there are 2 types of enemies and one boss that simply repeats.... really? I know most of the experience is interacting with your environment, and solving puzzles, but I'm just not sure this is my cuppa tea. It seems stuck in the middle between straight up physics puzzler and atmospheric adventurer. I'm more excited for You, Me, and the Cubes, Bit.Trip CORE and/or Cave Story. But hey, I hope this gets downloaded a million times, cause WiiWare could use some love for small independent developers. I've just recieved a copy of the 'Icarian' sound track from nintendo - or to be precise a link to it. A great game has just got that bit better. Just finished the game, I clocked 04:01, did LostWinds in 03:12 so this is the longer game for sure. LittleIrves - I didn't actually notice that theres only 2 enemy types until I read your comment. The final "boss" is certainly different though. @blackeyeddog did it work for you? My link just played a 6 second tune. I noticed the download helper add-on was flashing in my firefox though so I clicked that and it let me download the propper file which is 19 minutes long. The link didn't work to well at all.I had to right click on the link and use 'save target as...' to down load the file proper which as you say is about 19 minutes long. @jordanr: Did you collect all 20 items? I still have to do this, which will raise the gametime to about 6 hours. @LittleIrves: Well, this game doesn´t focus on enemies. Yes, there are just two, but this is not a fighting game anyway. @Falk Sturmfels - Nope I actualy only had 7 of the 20. I could easily get a few more hours out of the game if I searched for them all, but I am not really a perfectionist with those kind of things I would much prefer to enjoy a second run through of the game. jordanr: but its relative easy, because on the saveslot you can jump to the different levels - and there are announcements which tell you which levels have to be redone for the items. Don´t forget: there is an additional level after collecting all 20! Ugh ... I'm away for another two nights so I'm still stuck on level 10 until Thursday. Can't wait to get back to the grindstone and finish this baby off - most intrigued by the 'certainly different' final boss and the extra level. Waiting for this one to come out state side. Wiiware is getting some really awesome games! Good game, about to finish it. 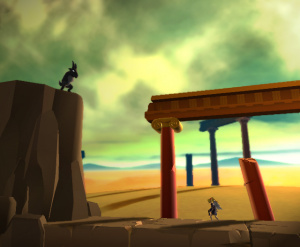 But a 9 surprises me as for the most part, this is a LostWinds clone. It was feeling 'slightly' different, up until you get control of ergh, wind, then it felt very very familiar. Still very nice mind, bit short but hey. love this game,is so greece. I can't wait to pick this game up... I don't know why they aren't releasing the game in the US store. Please do it soon! Is this really worth my $10, European gaming pals? This game has a very nice two-player cooperative mode. My wife and I have been trading off who controls the girl and who moves things around. I'm glad they set it up the way they did, and not with two controllable characters (as mentioned in the review). It's a lot of fun the way it is. This is certainly one of the best games on WiiWare. Its initial quest is a bit short (I've clocked about three hours), but unlike LostWinds, I didn't feel shortchanged by the length. In fact, NyxQuest may share elements with LostWinds, but it is vastly better. Smarter level design, varied gameplay, great music, and a nice challenge puts this game among the few current, enjoyable platformers. A must-buy. I have been playing for 6 hours and still haven't finished it. I guess the length depends on the person. I agree though that this is one of the best WiiWare games yet and it's a platformer which we don't have many of on WiiWare. This is my second favorite WiiWare game. Even though I liked Lost Winds, this one is way better. I would say 10/10. Surperb game and possibly the best Wii Ware has to offer. Everything comes together perfectly in this game from graphics, story, music, and controls. A must buy if you ask me. It took me about 6 hours to complete everything including relics, but it was such a satisfying game I did not mind. It looks pretty bad from what I have seen in trailers and pictures, never have seen why it was so hyped myself. This is similar to Lost Winds but it is really much different. This is more of a platformer where Lost Winds is more Adventure. I love them both, though maybe Nyx Quest just a little bit more. Drake, you give awesome reviews, but is it really necessary to make each review title a question? I mean, I understand if its for a bad game, but it just seems kind of unnecessary to do it for good games. 3h to complete 100%?? No freaking way, it will take more hours unless you are a very skilled gamer. Finally got around to play this game, and it really is awesome. The puzzles and atmosphere are great. The 3 hour completion time he talks about doesn't seem right though. It's gunna take me about 5 - 6 hours to complete everything including the bonus level.